Note: Today’s post is targeted to #101 level Milenomics. There may be cheaper and easier ways to book some of the flights discussed below if you’re a more advanced mile collector or spender. 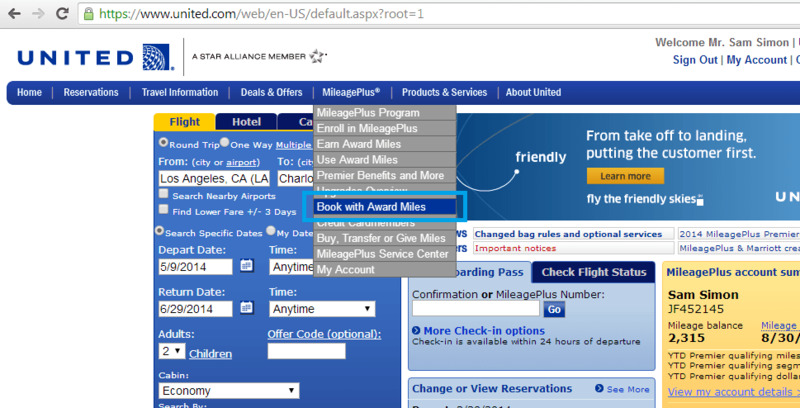 Today’s post is simply meant to introduce the idea of booking with United miles. Today’s post is another in the “Rookie Booking” series here on Milenomics. Milenomics strives to teach you how to book your own tickets, and use those miles you’ve been hoarding for far too long. Today’s post will go step by step into a United.com booking–and then will get into some more advanced tips and finally we’ll end with a free one way booking on united.com. Before you do any searches make sure you’re logged into your United.com account. Chase United Mileage Plus cardholders will especially want to be logged in. As a MP cardholder you will see award seats not available to the general public. Again, make sure you’re logged in while searching, as some available seats only show to logged in users. We’ve talked about the need for flexibility in using frequent flyer miles before here on Milenomics. Because today’s booking assumes we’re not flexible on our carrier (we will only be booking with United) we’ll need flexible dates, destinations, or cabins. We’ll step through two different bookings; the first for someone with a fixed destination, and the second for someone with fixed dates in mind. I’ll be going step by step for each booking. Fixed Destination: When do you want to go? With a fixed destination in mind you’ll want to have flexibility in your dates. 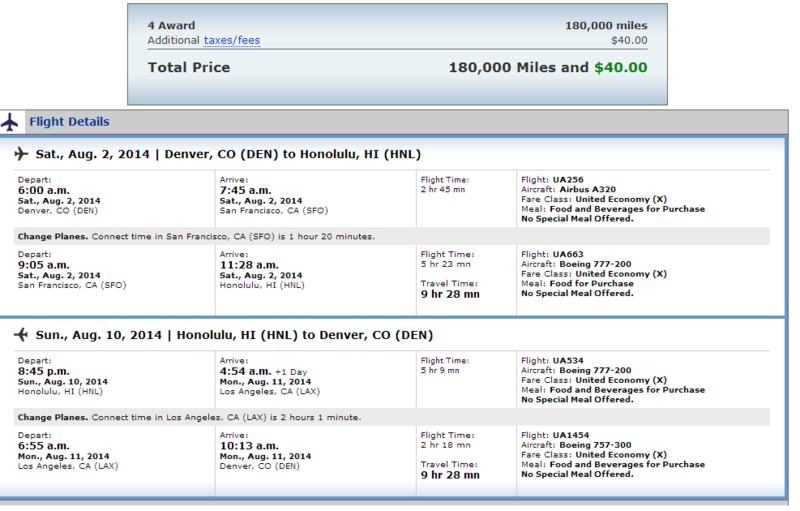 Today’s booking example will be a family of 4 wanting to fly from Denver, CO to Honolulu, HI. Getting there with miles isn’t tough, but you will need a good amount of flexibility in your travel dates to do so. Note: the date selected aren’t that important, you only need to pick a day in the month you want to start searching. Award tickets don’t have special pricing like paid tickets, so I’ve selected 4 adults instead of adding the kids separate. it isn’t too important to select the ages of kids so long as you’re going to ticket them (and you should always ticket all kids, even lap eligible infants). Looking at the above calendars Blue dates are First Class only, Green have eligible First and Coach seats, and Yellow are Coach only seats. There are sometimes low level seats available on “white” dates, so it pays to check days even if they’re not green or yellow. As we can see there are no available dates in Late June, and the only July options are the 4th of July, the 12th of July (First class only) and the 19th of July. August has plenty of yellow (low level coach) days as well. It really helps to take screenshots of both the outbound and return calendars and place them right next to each other. Doing so lets you quickly visualize which dates have available flights. Now we can start to see the issues with finding a return flight. If we take the July 4 flight out we have no options to return until July 20. If we take the July 19th flight out we have to either cut the trip short, and return just 5 days later on the 24th, or extend the trip to 10 days and return on the 29th. August looks much better–with Aug 2/Aug 10 (8 days) or Aug 7/Aug 14th (7 days) both close to our scheduled 7 day trip. Pro Tip: I like to use two windows when searching complex awards on United.com, one incognito and the other in a regular browser window. In each window I do a one way search, which allows me to see both directions at once. With these dates in mind we’ll return to the search screen and input our new dates as a Specific Date Search. Always pick the earlier dates first, doing so will allow you to see options on both the Aug2/Aug 10 and Aug 7/Aug14th flights. You can then pick the flights which have the shortest layovers, best times, etc. Clicking Select next to this flight will take us to the booking screen, where you can then start the process of adding traveler’s names and information, and then pay the $10 fee per person, and ultimately ticket your trip. 180,000 Miles plus $40 for a family of four to travel to Hawaii. I wouldn’t book this flight just yet. 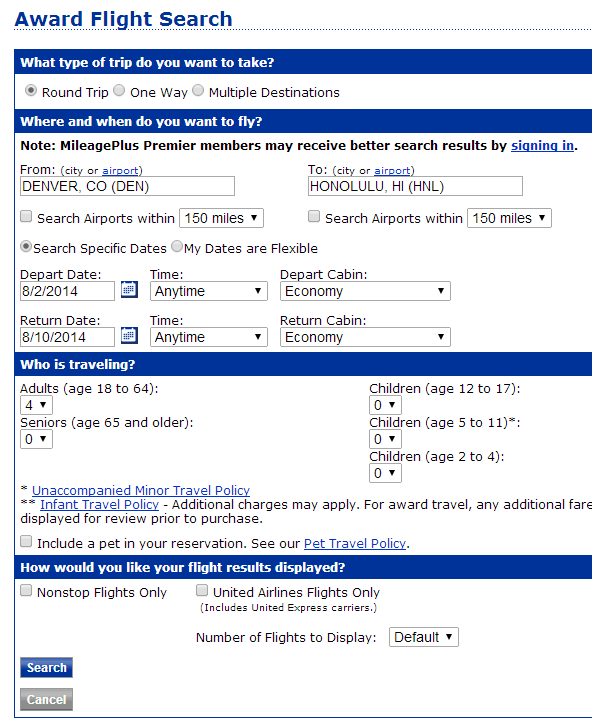 Remember, tickets to Hawaii on UA have the added benefit of a free one way flight. We’ll discuss how to book this free one way later in this post, and I absolutely suggest using it since it costs no extra miles and just $2.50 per person. When adding a Free one way it is important to take note of flight dates, times and flight numbers. We’ll be using those later, so grab a pen and write down what you’ve found above. Fixed Dates: Where do you want to go? 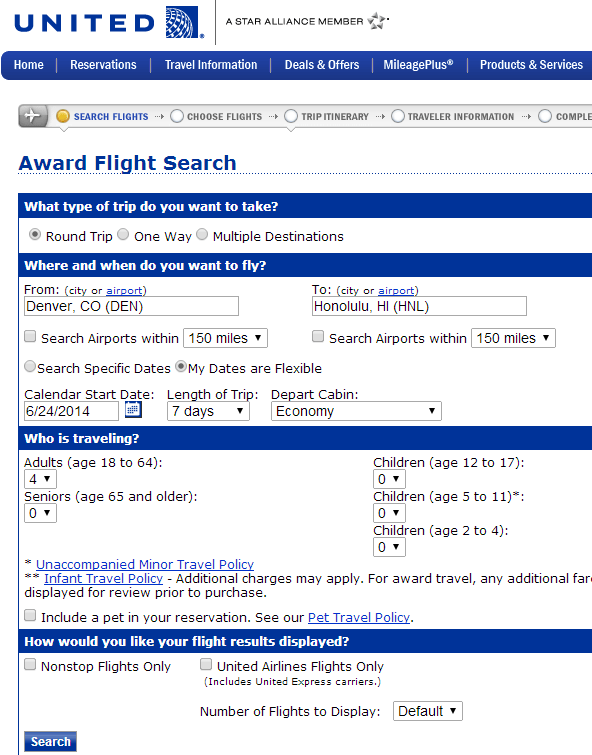 For Oneworld/AA the excellent AA award map helps you to find places you can go when your dates of travel are fixed. Until last week there was a similar service hosted by the Wandering Aramean’s W.A.T.T. Unfortunately, United’s lawyers killed this excellent search tool, which allowed you to input dates and see all possible destinations. With no real idea of where to go in mind this is where having a Demand Schedule would help. Knowing destinations you’ve always wanted to go to will give you a starting point for your searches for this trip. For quick destination changes the “Start a new Search” area of the results page can be useful. Here I’m starting my BOS Search from teh results page of my Washington D.C. Page. 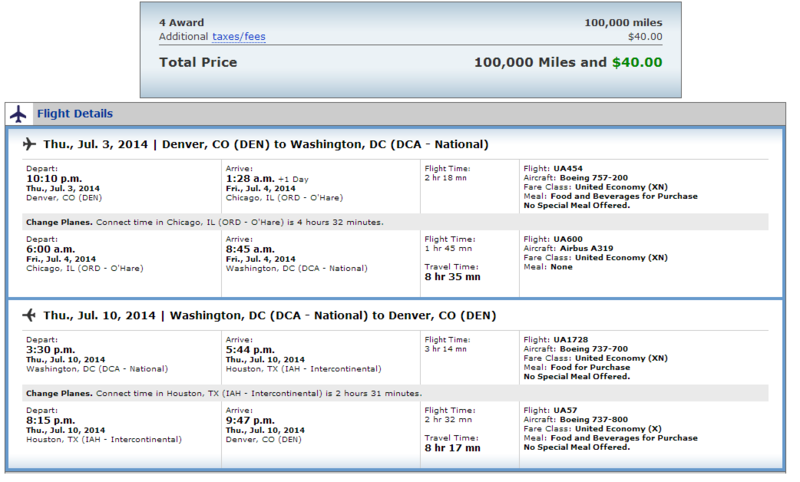 Washington D.C.: Flights out on the 3rd with a 4 hour overnight layover, and a good retun on the 10th via IAH. Boston, MA: Flights out on the 3rd and back on the 10th, but both directions have 5 hour overnight layovers in Chicago. 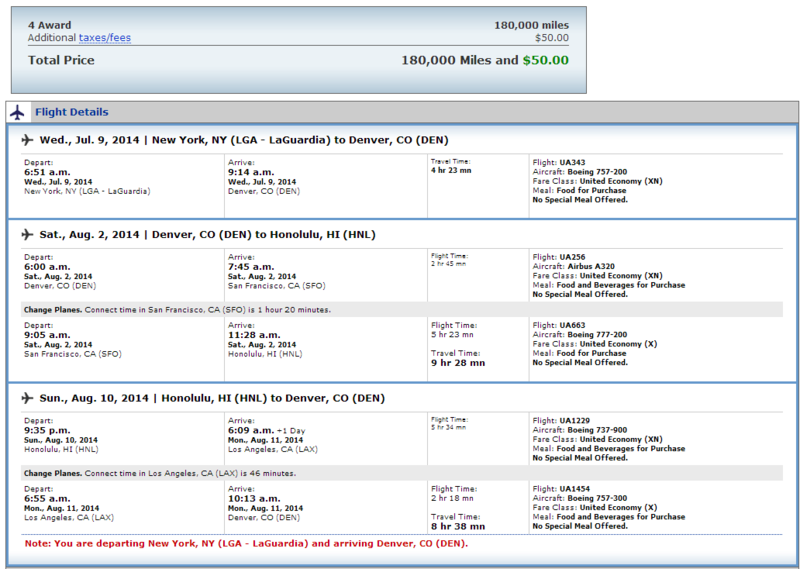 New York, NY: Some flights on 7/2 and 7/4 and really good availability Home on 7/9 (nonstop). Notice that some of these flights are booking into the ‘XN’ fare code. These are awards seats reserved for United Elites, or Milenomics BYOE’s with United CC’s. As I mentioned at the end of section one of this post, the flight to Hawaii is actually eligible for a free one way flight. Let’s assume we decided to go to NYC above for the 4th of July. If we turn this into our Free one way we’d be booking our return flight to DEN for free, but would still need to get to New York. 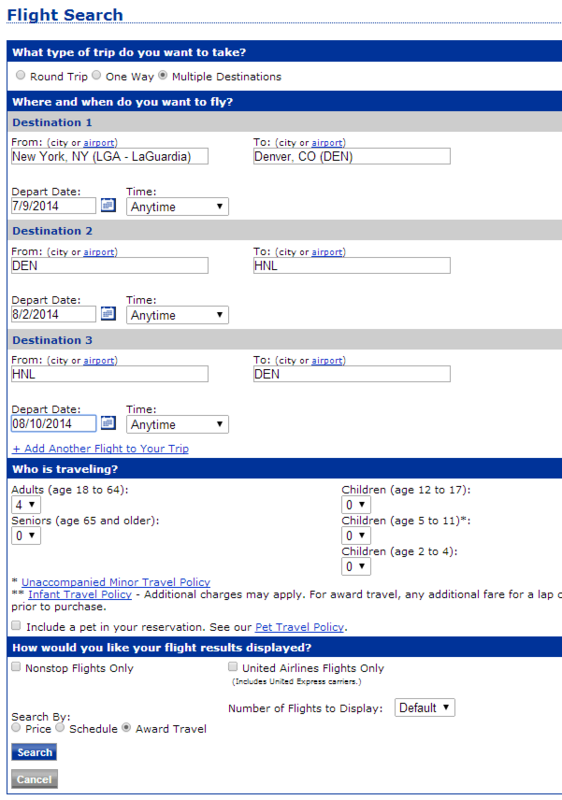 DEN-SFO-HNL, HNL-LAX-DEN (8/2 and returning 8/10) as our actual paid booking, on the dates above. Red will be booked with cash or Southwest points, Blue is our free one way, and Green is our award booking to/from Hawaii. Correctly pricing as a free one way. 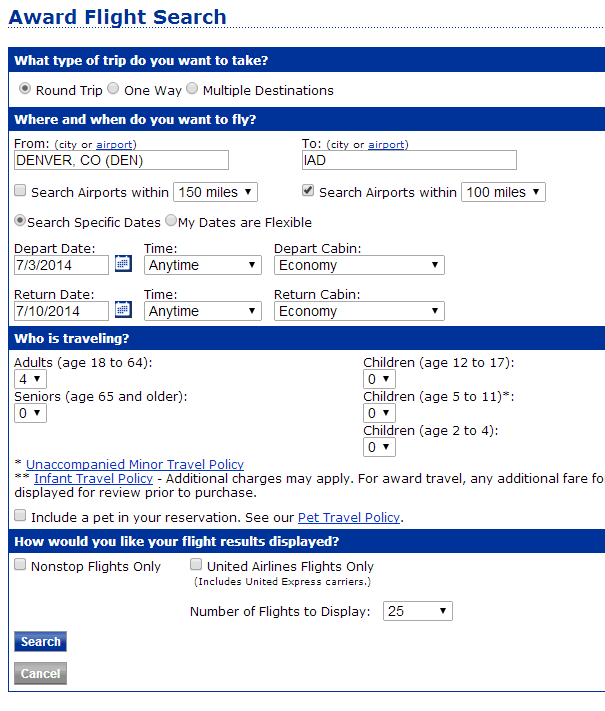 There are a few ways to force United.com to show flights as part of a Multi-City search when the site errors out. The first is to feed the exact routing. In this case, if we were having trouble I would input in my search LGA-DEN, then DEN-SFO, and SFO-HNL for the next two flights, and finally HNL-LAX, and LAX-DEN (on 8/11) for the final legs. When flights fall overnight, as well as with international flights, be careful of date changes. Sometimes ticking “United Flights only” and “Nonstop Flights only” will help return your flights. Ultimately if you find a routing that doesn’t work on United.com you may have to call in and ask for a phone agent’s help. If you do so I’d ask for the phone booking fee to be waived (may not work, but worth a try). Booking your first award ticket can be a nerve-wracking endeavor. The limited number of award seats makes the process seem so much more difficult from booking a paid ticket. Hopefully today’s post can be one you refer back to as you start to book your first United Flights. As always if you have questions you can find me on Twitter, Facebook, and Email. This was (mostly) a review for me, but I did learn about doing a stopover with United. Somehow I thought free stopovers necessitated “hub” cities and were done most often on international tickets and with AA. So this was both informative and good news. Looks like I will be going to Hawaii this fall. I will now consider how I can turn it into an itinerary allowing a free stopover by pairing it with some other trip. “Pro Tip: I like to use two windows for United.com, one incognito and the other in a regular browser window. In each window I do a one way search, which allows me to see both directions at once.” Does the instruction that holders of United CCs always be logged into their accounts run counter to being in incognito mode? Absolutely look at adding a free trip, maybe to the east coast, on the start or end of your Hawaii Trip. You could add the free trip up to 11 months after the date you book the trip, so well into next year. 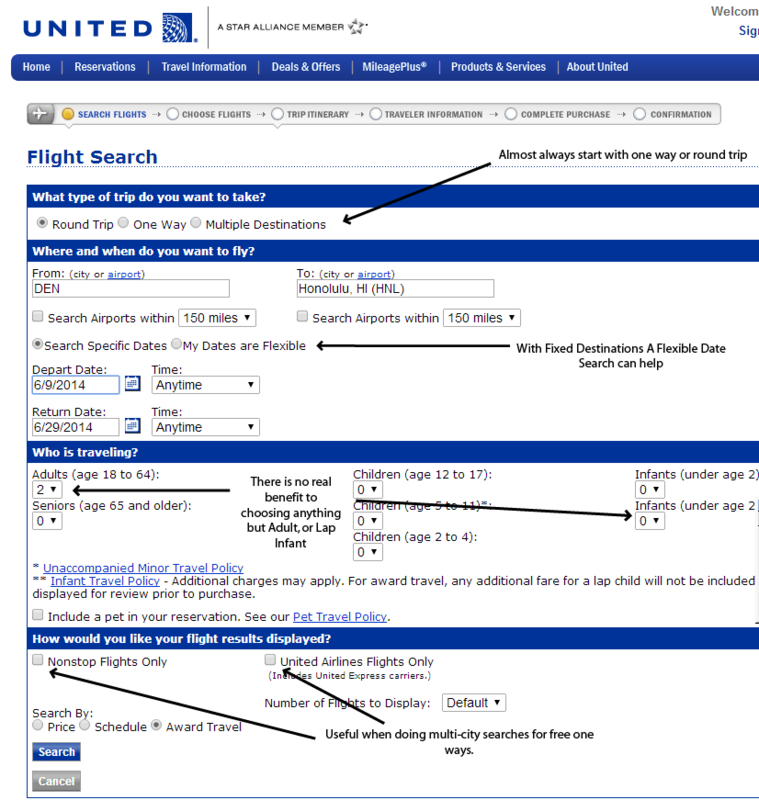 As for the tip: United.com will only let you use one window to search. If you open multiple windows to try to do more than one search your first window will show the results of your second search, based on your cookies. I like to break my searches up and do each segment, or each one way as a single search. By opening one window incognito, and the other in a regular window I’m able to search two searches at the same time. While one search is “thinking” I’m working on the other, and vice-versa. A small example: in my main window I would search DEN-HNL (and the return) in my incognito window I could be looking for free one ways to/from DCA, NYC, BOS, etc. I went ahead and tried to clean up the wording on the above tip, it is a bit confusing. OK, but are you logged in with your FF # in both windows? I am logged in on both windows. Allows me to see XN (Credit card) award space in both. Thanks. Very good to know and confirms my instinct to read the Milenomics 101 posts too! The problem I have seen trip people up more than any other is showing no space on international trips from non-hub cities. In those cases you have to search from *A hub cities, and from your airport to the hub city, and then stitch together an itinerary. If you’re lucky multi-city may work, or you have to call in. Living in a major hub I’m a bit spoiled. Thanks for the great tip Kenny. This is good advice. Unfortunately, United is turning out to be a royal pain in the *ss for me. I found a date in July to fly out to Indonesia using my miles, and even though I can actually stay for around 30 days, there were NO return flights in the ENTIRE month of August! Terrible! Data point from Jan 2015: When trying to book a March 2015 one-way on United (with AI, LH codeshares) from CCU to BWI with a 3-day stopover in my port-of-entry BOS, the agent insisted that I couldn’t get the whole trip for the price (i.e. miles) of the CCU-BOS. Is the “free stopover at port of entry or gateway” no longer possible, or had I been misinterpreting the information here and in other forums? Thanks. Finally…..Excellent instructions on this newbie trying to figure out how to get from SAT to Koror on United…. clear and to the point. Much appreciated!